Why books make the best birthday gifts. This is my first birthday away from you. I’ve left for my birthday before but I at least got to spot your messy bed-hair before I left or kiss your tired faces when I got back. I’ve never spent my entire day away from you until today. I’m celebrating my 32nd year of life at a conference in snowy Philadelphia. Yesterday, I was extremely fortunate enough to take part in a book evaluation training intended to prepare people to serve on book award committees. To say I was in awe would be putting it lightly. Some of these leaders have been serving on committees for more years than I’ve been alive. They shared valuable insight about what being on a committee means, including the fact that some of them had to read upwards of 1,200 books the year they served on a committee (or they had to read 300 books that they had to read 2-3 times each). It was astonishing! I don’t know that I’ve read 1,200 books in my lifetime. I felt incredibly inferior and I wandered if I’m doing librarianship wrong. If I am not reading enough to have considerable knowledge on much of anything. I watched librarians swarm the exhibit floor to grab free books and I wondered if I should be collecting books in the same way you girls collect rocks. Relentlessly, ruthlessly and encompassing everything in my line of sight. In the end I couldn’t do it. I did grab several books to give away, and one or two for each of you, but I knew I wouldn’t have time to read much of what I take home from this conference. Today I sat listening to authors read excerpts from their upcoming books. Most of the authors are very well known but one of the authors is a newbie to the field, just having published her first novel. When Natalie Lloyd got up to read from her book several in the audience had already slipped out. She talked about books and libraries as a saving grace as many authors and librarians do, but she said one of the most profound statements about books that brought me to more than tears when I least expected it. When she was growing up she had a rare disease that made her constantly fracture her bones. When she would go to the hospital to have them set her broken legs, to deal with the horrible pain she would grasp onto her father’s hand, close her eyes extremely tight, and imagine what it would feel like to hold onto Aslan’s mane. I don’t think I’ll ever remember those words with dry eyes. Because to me, THAT is how you collect books. Not in the number you have read. Not in the amount of space they take up in your home. But in the moments that they help you escape this life for something different, the moments they spark something that you didn’t even know was ignitable, the moments you move people to weeping just talking about a book that you’ve read. This is how you collect books. If you choose carefully even a few can go a long way, and then I don’t have to throw them away when you aren’t looking like I do with your rocks. So although I am away from you on my birthday, I still think it will be a fantastic day. I have these books to look through and appreciate. Hopefully one of them can be added to your collection of adventures as well. Maybe it will make you laugh. Maybe it will make you cry. Maybe, as in the case with Natalie, it will get you through a situation that doesn’t seem bearable. That is the beauty of books and why they make the greatest birthday present. You just never know what they will do for you. 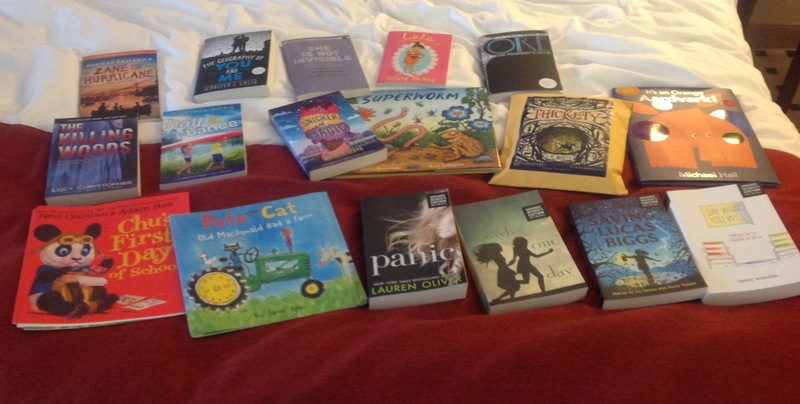 A great birthday when you have all these books to choose from! Meg, I am so honored to be any part of this beautiful post. Thank you for coming to the brunch, and for taking my book home with you. Thanks especially for your sensitivity to the readers in your life – your kids (whoa are they lucky to have you for their mom!) and the young readers you work with. I think a story belongs to anybody who wants to take it into their hearts for a while. I’m thrilled you’d want to read mine. I hope you had the sweetest birthday! Love it! After reading that I want to rush off to the library!